Welcome to the official start of the Snowflake Shimmer Quilt Along! I am so excited to get started and I hope you are too! The Snowflake Shimmer Quilt Along will run from July 1st, 2016, until October 7th, 2016, with a set of directions or a link up party revealed on the Fridays listed in the schedule at the bottom of this post. The quilt will finish at approximately 72″ x 88″, a very generous lap / twin size, and the Snowflake Shimmer quilt is a beginner level pattern. The directions will be posted to this blog (and can always be found in the Blog Hops tab above) and e-mailed to the quilt along email distribution list which I will be forming starting today. Want to be added to the e-mail list? Simply add a comment to this post or send an e-mail to me at jetgirl8 (at) gmail (dot) com to get a more printer friendly version of the monthly instructions. 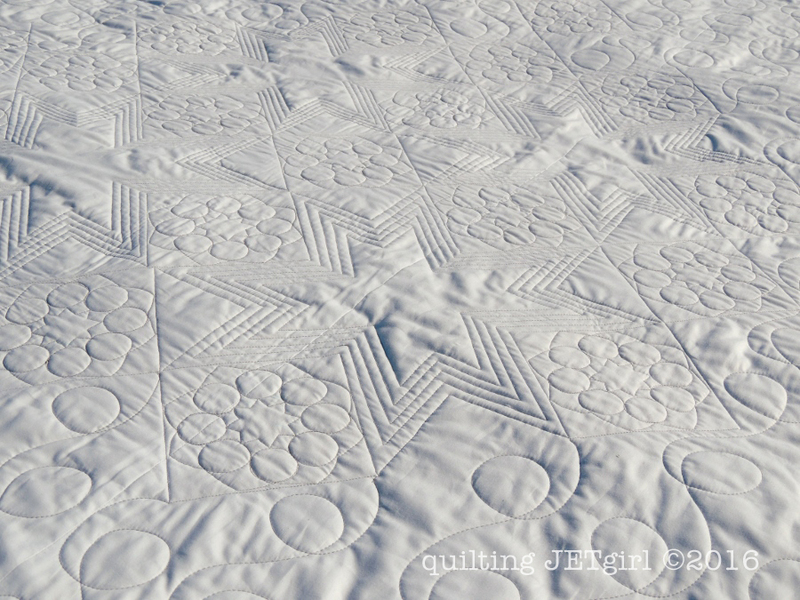 Please share your progress pictures on social media with the hashtag #SnowflakeShimmerQuilt or in the specially created Facebook Quilting Jetgirl page. And now onto June’s instructions… oh wait, you might want to see the design first, right? I am excited to share with you Snowflake Shimmer! 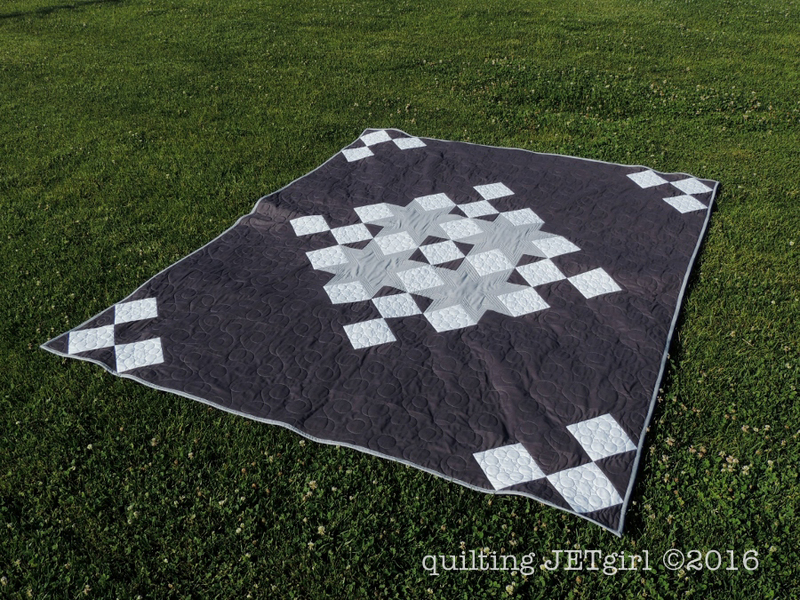 Once again, I learned that photographing larger quilts can be a bit of a challenge, especially when I work solo! Thankfully the park sprinklers had not yet reached this area of the grass, so I was able to spread it out and take a few photos before frantically gathering it up when the sprinkler system hissed to life. At 72 x 88, this really is a very generous sized quilt. Above, I draped it on my queen size mattress with the top even with the headboard to show how large this quilt will be when you are finished. And no quilt finish post (even if it is the kick off of a Quilt Along!) would be complete without showing off the quilting texture on the quilt back. I quilted using 50wt Aurifil 2605 (Grey) in a combination of large looping swirls in the background (hoping to evoke the floating, meandering path a snowflake can gently fall in), straight line echoes in the secondary star patterns, and a fun free motion quilted snowflake motif that I designed and will be sharing with you as a template when I talk about quilt finishing during the Quilt Along! I did the background and star quilting on my longarm and traced the templates and sewed the snowflakes using free motion quilting on my domestic machine. Fabric A (lightest color value), 1 ¼ yd. Fabric C (darkest color value), 4 ½ yds. Backing Fabric, 5 ¼ yds. 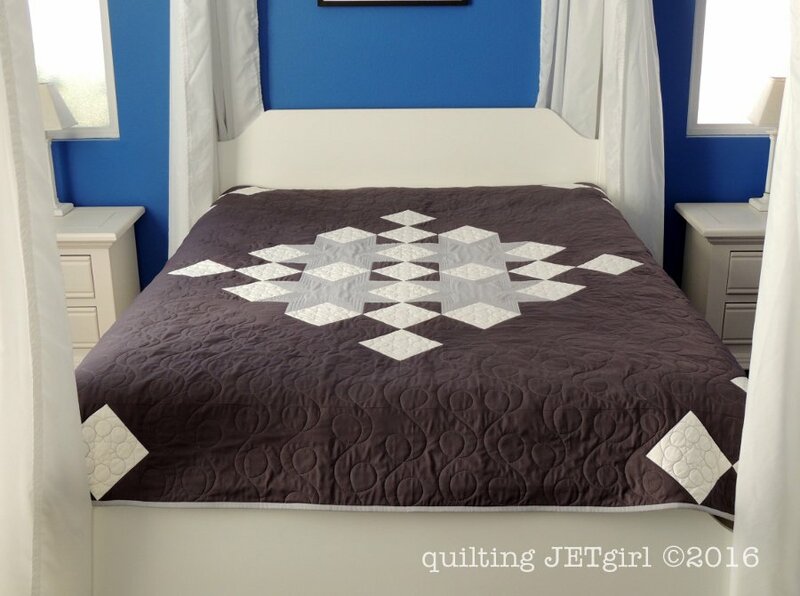 In addition to fabric, the Snowflake Shimmer quilt requires a 9ʺ square ruler (or larger). If you have a large rectangular ruler that is over 9ʺ long on each side, that would also work. Michael Miller generously donated Cotton Couture solids to make the sample quilt and the quilt that I will be making during the Quilt Along. The Fat Quarter Shop has bundles of the blue and gray Michael Miller Cotton Couture colorways available for purchase (links below). You will still need to purchase your backing fabric, but these kits have everything you need for the quilt top and binding in either colorway. I am suggesting the background is dark (Fabric C), the stars in the center are a medium tone (Fabric B), and the diamonds that form the snowflake shapes are lighter (Fabric A). What matters the most is that there is a tone contrast between your three fabric selections. Prints can work really well in this design, especially in the stars (Fabric B) and diamonds (Fabric A). To evaluate your fabric selections, take a photograph of your fabric and convert the image to greyscale using the photo editing software you are familiar with or a filter in an app like Instagram. 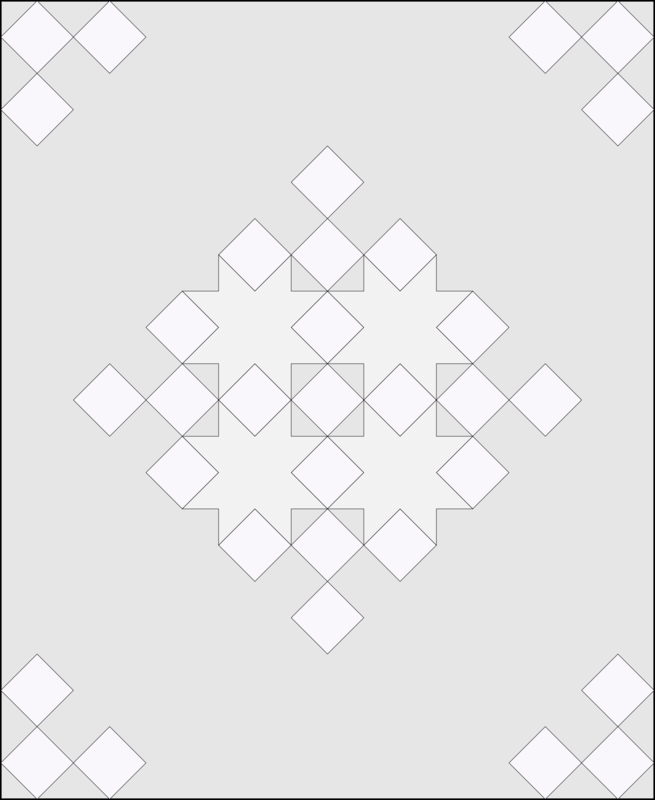 Below is a blank quilt pattern that you can use to color and plan your layout. I also like to use blank patterns to doodle and design my quilting motifs. Play off the “snowflake” theme by using snowflake fabric. Play off the “shimmer” theme by using metallic fabric. To download the Fabric Requirements PDF, simply click on the link or image above and save the PDF that opens. Each week, my goal is to also list a few tutorials or other reading material that might support or help this QAL. This week I have a few tutorials of my own to share along with a very inclusive fabric selection tutorial from Diary of a Quilter. If you are stumped at any point in the QAL, please leave me a comment or send an email. As I mentioned above, if you would like to join the email list to receive each new instruction as a PDF via email, please comment or email me at jetgirl8 (at) gmail (dot) com and I will begin an email list that will be active starting with the Fabric Preparation instructions on July 29th. On Friday, July 22nd, I am going to open a linkup for you to share your fabric selections. The link up will be open through Thursday, July 28th. By linking up, you will become eligible for one of the (4) prizes from awesome sponsors Aurifil, Meadow Mist Designs, Sew Fresh Quilts, and Quilting Jetgirl. If you do not have a blog, you can link up by linking to an Instagram photo. If you do not have Instagram, you can email me during the linkup time frame and I will make sure you are included in the random drawings for the giveaways. There is nearly a month to get your fabric selections on hand before July 29th, when I will be releasing the details on fabric preparation. I am really looking forward to seeing what we create together! I love snowflake items as well as snowman everything. Thank You for the time and effort you are taking to do this for us. Could you please add my name to your mailing list. Thank you. Looking forward to this one. I would love to be on the mailing list for this quilt along. Fabulous design and love your fabric combo! 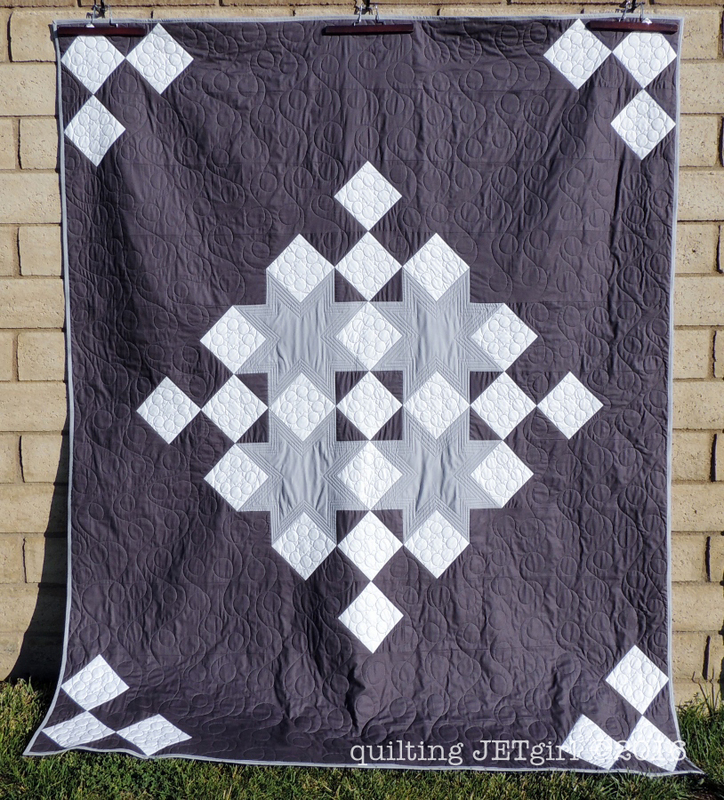 A lovely simple design, perfect to practice negative space quilting. I know that I am really late getting to the party but I love the quilt! I really want to make it for my husband but our bed is a queen. Is it possible to alter to a queen size? The colors are just perfect!! !